The global immunoprotein diagnostic testing market is projected in a report by Transparency Market Research (TMR) to see a rise in research and development efforts taken by companies to gain a strong foothold. Other business strategies that could be adopted in the market are regional expansion, tactical partnership, merger and acquisition, and new product development. Beckman Coulter, Inc. and Ortho Clinical Diagnostics joined hands in June 2016 for the sale of VITROS 3600 Immunodiagnostic System. In May 2016, DiaSorin entered into a purchase agreement with Quest Diagnostics to buy Focus Diagnostics’ molecular diagnostic and immunodiagnostic products business. The TMR report identifies Abcam PLC, Binding Site Group Ltd., and Thermo Fisher Scientific, Inc. as other important players of the market. 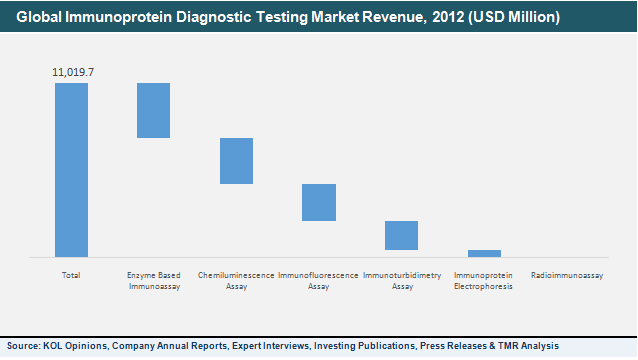 According to the report, the global immunoprotein diagnostic testing market could earn US$15.3 bn by the end of 2019. In terms of application, oncology testing is expected to account for a larger share of the market, bagging a US$4.9 bn by the same year. By region, North America could take hold of a king’s share of the market all through the course of the forecast period. Developing countries with increasing demand for preventive, accurate, and quick healthcare are anticipated to set the tone for valuable growth in the world immunoprotein diagnostic testing market. Growth of the market could also be supported by expanded global distributor network, improved use of immunochromatography, commoditization of products, and technological advancement. Owing to its advantages such as ease of use, safety, sensitivity, wide-scale application, and feasibility, chemiluminescent assay is said to have achieved massive demand in the recent past. Free light chain diagnostic tests are expected to show a quick rise in growth considering their initial stages of development. On the other hand, C-reactive protein diagnostic tests could be largely used because of their accurate and effective diagnosis of cardiovascular diseases, strokes, inflammation-related disorders, and injuries. The international immunoprotein diagnostic testing market is foreseen to carry an impressive growth potential for the next few years. However, there could be some factors paralyzing the rise of market growth. For instance, expensive cost of diagnosis and unaffordability of patients in less developed nations are foretold to hamper the demand in the market. Nonetheless, urgent need for fast diagnosis due to rising mortality rate on account of high prevalence of type 2 diabetes, rheumatoid arthritis, cancer, and other chronic diseases is prognosticated to create lucrative prospects in the market. Furthermore, companies are recommended to upgrade to latest technology, tap into the future of oncology testing, and explore opportunities in the allergy testing market to increase their share.